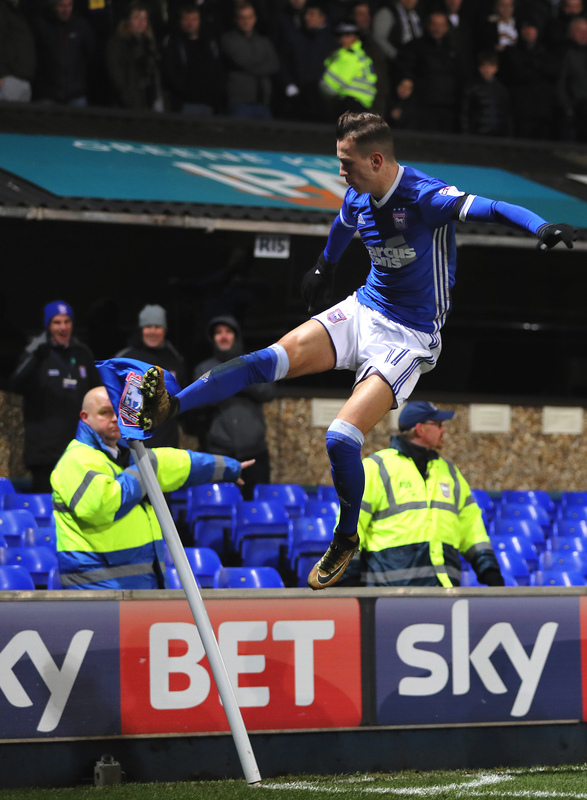 Bersant Celina’s brilliant 30-yard second-half strike saw Town to a 1-0 victory over 10-man Leeds United at Portman Road. Whites midfielder Eunan O’Kane was dismissed on 37 for head-butting Jonas Knudsen and Celina sealed the Blues’ first win of 2018 in the 67th minute. Dean Gerken started in goal for the Blues for the first time in the league this season with regular keeper Bartosz Bialkowski out with a minor calf injury. Cole Skuse, Joe Garner and Martyn Waghorn came back into the starting line-up for Luke Hyam, Kevin Bru and Freddie Sears, who were all subs. Young defender Chris Smith was on an inexperienced bench having been recalled from his loan spell at Chelmsford. Leeds made seven changes from the side which lost 2-1 to Newport County in the FA Cup last week. Prior to kick-off there was a minute’s applause in tribute to Blues legend Ted Phillips, who died earlier in the week aged 84. Town claimed a penalty in the fifth minute when striker Joe Garner was caught by a Leeds boot inside the area. Referee Robert Jones waved the protests away, appearing to indicate that Garner, who subsequently required lengthy treatment, had handled the ball prior to receiving the kick. The Blues started slightly more brightly than the Whites, who went into the match five places and seven points above the hosts, in a quiet opening but without creating a serious chance. In the 15th minute Gaetano Berardi crossed from the Leeds right wing and Gerken collided with Kemar Roofe as he sought to punch. The loose ball fell to Ezgjan Alioski, but he scraped wide. Three minutes later, Skuse fed Celina on the left and the on-loan Manchester City man cut the ball back towards a number of Town players breaking into the box but a Leeds defender toed the ball back to keeper Felix Wiedwald. The West Yorkshiremen went closer on 19 when Pablo Hernandez cut back from the right to Pawel Cibicki, but the Swede mishit wide when he ought to have done better. Three minutes later, Celina played in McGoldrick on the right of the Leeds box but Garner was unable to direct his chipped ball on target beyond the far post. Leeds were forced into a sub on 28 with Hadi Sacko replacing Cibicki, who had undergone treatment a few minutes earlier following a tackle by Iorfa. There was a scare for the Blues in the 32nd minute when Roofe escaped down the right and cut into the box. Jonas Knudsen, playing at left centre-half, held the ex-Oxford man up before slipping, but skipper Luke Chambers blocked the striker’s subsequent shot. Leeds were getting on top and were beginning to dictate the game but in the 37th minute they were reduced to 10 men. Callum Connolly saw the ball out of play on the right and was shoved unnecessarily by O’Kane. Knudsen appeared to remonstrate with the Irishman, who head-butted the Danish international, flooring him. Referee Robert Jones, who was close to the incident, immediately showed the ex-Bournemouth man a red card. 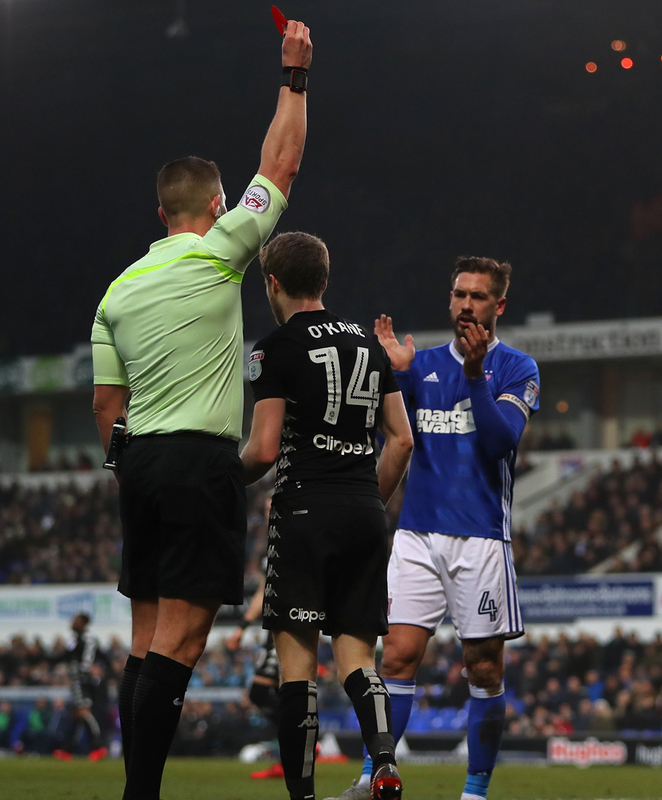 There was little complaint from the Leeds players as O’Kane very slowly made his way towards the tunnel and Knudsen underwent treatment at length before continuing. It was Leeds’ fifth red card in their last nine visits to Portman Road. Two minutes before the scheduled end of the half Waghorn hit the outside of the post with a corner from the right. Now with a man advantage the Blues began to dominate. Celina cut a dangerous ball back from the left which Vurnon Anita turned behind ahead of Garner, although referee Jones awarded a goalkick. In injury time, Celina was inches away from opening the scoring, the Kosovan international curling a brilliant 25-yard strike past Wiedwald but off his left post. Connolly was first to the rebound but his shot was deflected wide, referee Jones again erroneously giving a goalkick. Moments later the official’s whistle ended a half which had really only burst into life in the closing stages. Town just about shaded the opening but Leeds had created the better chances and had started to get on top when O’Kane needlessly got himself sent off. The Blues had begun to make their numerical advantage tell as the break approached with Celina unlucky not to have broken the deadlock with his late strike. Leeds swapped Alioski for Conor Shaughnessy ahead of the second half and the visitors threatened six minutes after the restart, Kalvin Phillips hitting a shot from distance which Gerken claimed to his left. The Blues forced Wiedwald into his first stop of the second half soon afterwards, Connolly working himself space to shoot from the edge of the box. The keeper parried his effort away to his left but to Garner, who hit his effort across the face and wide. Connolly was yellow-carded for a foul on in 55th minute and then, after a short spell of Town pressure, Iorfa joined him in the book, for illegally halting a Leeds break. Garner blazed high and wide on 65, then a minute later McGoldrick was fed inside the area on the left and played the ball back to Myles Kenlock, whose cross was just too high for Iorfa at the far post. But Town fans didn’t have to wait too much longer for a goal, and what a goal it was. Celina brought the ball in a long way from the left before smashing an unstoppable 30-yard strike past Wiedwald and into the net before celebrating his eighth goal of the season in front of the Fortuna Düsseldorf fans in Section Six of the Sir Bobby Robson Stand. The Blues quickly went looking to add to their lead, Garner powerfully heading Kenlock’s 70th minute cross goalwards but too close to Wiedwald. Two minutes later, Chambers did well to block as Roofe sought to turn Sacko’s cross from the right towards goal. On 76 Hyam took over from Skuse, then four minutes later Pontus Jansson was booked for lengthy and vociferous dissent even though his side had been awarded a freekick. And in the aftermath of the freekick, Leeds almost equalised. Roofe played the ball back to Hernandez on the right and his cross was somehow diverted up and over the bar at the far post by Leeds skipper Liam Cooper. The visitors, backed by 3,537 fans across the Cobbold Stand, went close again moments later, Hernandez sending a powerful 25-yard effort not too far over Gerken’s bar. On 88 Phillips was booked for a foul. Jansen did well to avoid a second yellow card for a foul on Garner having continued complaints towards the referee, who may well have issued another red card but for Leeds already being down to 10 men. Leeds put the Blues under some pressure in three minutes of injury time and Gerken was forced into his most significant stop of the afternoon, diving to his right to save Pierre-Michel Lasogga’s well-struck shot from the edge of the box. But Town were not to be denied their first victory of the year. Celina’s superb goal was very much the highlight of a scruffy but entertaining and incident-packed game with the Blues never threatening to truly put the visitors to the sword with few real chances to add a second or more. Leeds threatened rarely on the break but with the Blues backline and Gerken in goal comfortable for the most part, although Cooper will wonder how he failed to take his chance. The win ends the Blues’ run of five games without a win in all competitions and moves Town, who are still 12th, to four points from Sheffield United in the final play-off place. Town: Gerken, Iorfa, Chambers (c), Knudsen, Kenlock, Skuse (Hyam 76), Connolly, Waghorn, McGoldrick, Celina, Garner. Unused: M Crowe, Sears, Drinan, Bru, McDonnell, C Smith. Leeds: Wiedwald, Berardi, Jansson, Cooper (c), Anita (Lasogga 78), Phillips, O'Kane, Cibicki (Sacko 28), Hernandez, Alioski (Shaughnessy 46), Roofe. Unused: Lonergan, Grot, Dallas, Klich. Referee: Robert Jones (Merseyside). Att: 18,638 (Leeds: 3,537). Beating a team in the Top 10 -Good , Bersant has that bit of magic in him . Good job . now build on it ...Did it for Ted ! Thank you Jonas you won that!! On another note today proved the away fans need to be at the north stand end b st atmosphere for years!!! Makes a nice change to go home after enjoying a game and what a strike by Celina!!!! Celina'a strike was a tribute to Ted the kind of goal he reveled in. Two average teams separated by a moment of madness by a dirty Leeds player, before that incident it was all huff and puff but Celina's goal was a bit of quality that deserved to win any game. Mick will be relieved to get 3 points on the board for the first time in which it feels in ages but don't get too carried away by this as Leeds can blow just as cold as what they do hot. Will this win 'springboard' us on to a better string of results?...I doubt it. Best news today Flores has turned down Stoke O’Neil now first choice McCarthy to Irish Republic happy days. Obviously changed the game the sending off. I believe it was a very even game up until that point and probably would have ended a draw if 11v11. Having said that, was an obvious red card, a moment of stupidity from their player, but a wonderful goal to win it. Notable mentions okay for Celina, Garner and Knudsen. (Much better CB than LB) see knudsens long term future as a CB. Iorfa awful once more if truth be told. Away need to be next to north stand, makes for such a better atmosphere. Just goes to prove McCarthy was wrong in not naming Celina in the team against a poor QPR on Boxing day ! Great atmosphere,Celina's goal was top drawer.Excellent win.Knudsen is proving to be a very good CB.Well done Town,welcome three points. he was delighted with win ,whatever else has gone on today, Mick on radio just now, what else went on today ? Anyway we got a win well done lads 3 points in the bag. The best atmosphere in a long time. Credit the Leeds fans for helping to create that. Agree Knudsen best at CB. Although he must remember where is playing and not turn with the ball into a danger area like in the 37th minute. He got away with it so looked cool calm and collected but could’ve been different another day. Carried DMcG in the first half. He contributed slightly more in the second but not much. Just off the pace. We can not afford to carry people. Not sure the sending off changed the game as much as some claim. Leeds didn’t really create anything with 11 on the pitch. They had more of the ball so do every team we play. An enjoyable win made all the more enjoyable but beating those cocky Leeds fans. Why we shut off Portman Road after the match I will never understand. Just keep the Leeds fans in for 10-15 minutes after the match. Let’s the majority get out of the way and on their way home. The way it was done today must require much more police manpower and is fairly pointless because we can mingle in the car park or on the bridge towards the railway station. When I went to Milan we were kept in for an hour or so after the game at 11 at night. 10-15 minutes at 5pm wouldn’t be a hardship. Nice to get the win today. Best atmosphere in the stadium for years. Previous posters make good point about moving away fans to North Stand end. Hope the club reconsiders this. COYB. Well, at least it was a win. Celina stood out in having the two best moments. Credit to all the fans, home, Fortuna & Leeds in making a decent atmosphere for an utterly terrible game of football. Most of it complete dross. Did either keeper actually make a save? How McCarthy gets away with this is astonishing. Put away support in North End FCS it must be better than at the other end. But agree to hold away supporters for 10/15 mins it makes sense. Head scratching new " sponsors"
Mick gives most turgid press conference yesterday. Get in well done all. I would check with the club as I'm unsure nowadays unlike in past years that the clube have the powers to keep fans inside grounds unless disorder is likely. Seems I'm in the minority concerning Celina Yes he scored a great goal but he's a liability and loses the ball far too often. The great wingers run hard at defenders particularly in and around the box like Gifts but Celina always stops and comes inside and usually ends up getting knocked off the ball. On a positive note I was impressed with Knudsen and Kenlock overall but disappointed that we couldn't retain possession and control. The last 10 minutes was all Leeds and we just kept giving the ball back to them. The next 4 games will make or break the season hopefully McCarthy will encourage attacking play and shoot on sight. Relieved to get a win. Up to the sending off thought it was a poor game. First half generally poor apart from the effort before half time. Didn’t actually think the second half was great either BUT the goal was worthy of the entrance fee and deserved to win any game. We now need to build on it. Consistency needed with three very winnable games in quick succession. Thought Chambers was excellent today.